Both male and female Black-capped Chickadees share the same coloration; predominated by the distinct black cap and bib. The flanks are olive in color and the greater wing coverts are prominently white in color—this distinguishes them from other similar chickadees, such as the Carolina Chickadee (P. carolinensis). The Black-capped is also slightly larger than the Carolina, at around 13 cm. There is some hybridization with the Carolina that occurs where the ranges overlap (the Carolina is found in the American Southeast), but the Black-capped is generally separate in range and habitat. The Black-capped displays a rigorous hierarchy and their songs are directly related to the rank of the male. During the breeding season, the most common time for singing and mating is just after dawn, and is led by the leading males. The female will lay between 5 and 10 eggs, but the male is a devoted parent and aids in the broods care start to finish. 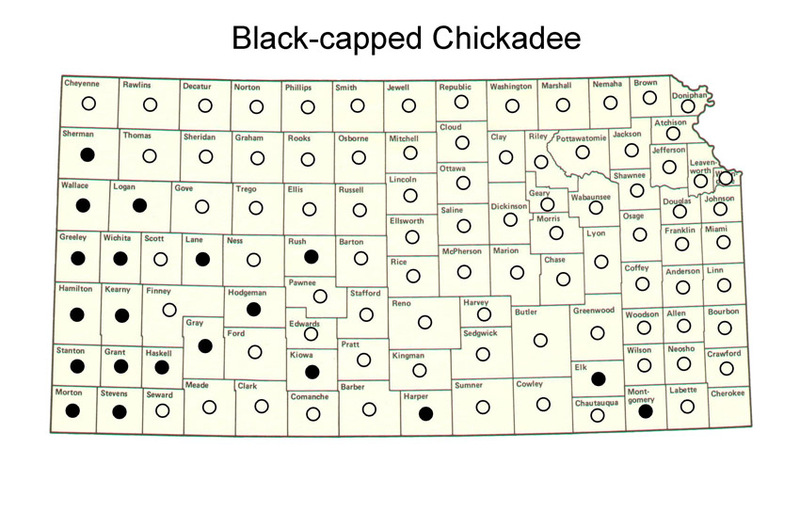 Within Kansas: The Black-capped Chickadee is common throughout Kansas and has established breeding pairs in most of the state (indicated by white dots), with only a few western counties with no reported breeding (indicated by black dots). Within North America: The Black-capped Chickadee is a year round occupant of much of northern North America, avoiding the lower reaches of the continental U.S.
Habitat. Foraging in brushes and low trees, the Black-capped inhabits clearings and less dense woodlands; however, it is also becoming increasingly sighted in suburban areas.